Bio: "Formed back in early 2014 by seasoned devotees of the German underground (featuring past and present members of bands such as Beyond and Nocturnal), this three-headed beast spreads an aural plague in the form of primal, decayed, malevolent, venomous, eerie and crawling Death/Doom Metal [...]"
Germany’s trio known as The Fog came to life back in 2013, and has held onto the same stationary line-up ever since formation. Aside the inclusion of Daniel “Avenger” Cichos, who has roots in plenty of respected groups such as Exorcism, Terrorizer, and many others, the rest of the act is filled up with fairly fresh talent including “V. Lord” Matthias H., who was involved in Beyond and Blackwhole for live shows, as well as bassist C.C. Defiler with no other bands attributed to his name. This does lend an air of anonymity to an otherwise unearthly sounding act rooted in the early days of the death and doom metal fields, a trait that was shown off on their 2014 demo Void Nexus. 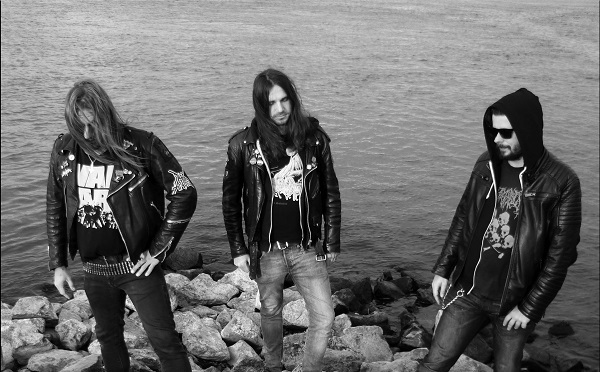 About a year-and-a-half later, this three-man act find themselves signed to Memento Mori for their debut full-length effort, Perpetual Blackness. But does it stand as a worthy effort on that growing label’s ranks, or is it more of a phoned-in love letter to the late eighties and nineties? Akin to the generation the band is paying homage to on this release, Perpetual Blackness does carry the customary raw trait that is all too common for the style nowadays. Thankfully, it doesn’t come off as a cheesy gimmick to illicit the attention of fans of the days of analog recording techniques. It is, however, a bit of a double-edged sword, working both in favor and against the trio in certain aspects. Unlike their Void Nexus demo, this effort presents itself with a remarkably crisp output that seems more digital than it does lo-fi, but carries itself more like earlier Cathedral laced with Incantation brutality and Autopsy grime. The drums have a decent echo, the guitars plenty of distortion, the bass is ripe and punishing, and the vocals are largely sinister rasps with harshened growls thrown in for good measure, all of which bounce off non-existent walls. However, it’s right out the gate that this sort of presentation actually works against the group. The first half of “Inaneness” actually sounds more like an extended introductory instrumental, the kind that would take no more than a minute-and-a-half to get through before the next track’s blistering brutality would kick in. Instead we’re given a prolonged dose of eccentric death metal filth that takes its time proceeding into your standard funeral march, and eventually a catchy groove that doesn’t fit thanks to the lack of a transitional bridge to make sense of the increase in speed and drum presence. While catchy, none of this feels fluid. presenting rather patchy ideas and riffs thrown together to attempt to give the listener an idea of what The Fog is all about. But, in reality, it makes you want to skip past the track all together, if not turn right around and immediately shrug the band off without waiting for the eventual pay-off about five minutes in that still isn’t too great or like anything more than sitting buck naked on a mild grade sandpaper, waiting for the discomfort to end. Thankfully, it does. “Creeping Lunacy” establishes itself as a well paced performance, varying between slower tempos and mid-paced aggression complimented with that half-crazed raspy vocal approach that works so well on almost all of the performances of this release. The best part of it, however, is the bass-heavy grooves that hit about two-and-a-half minutes in, as well as during the lengthy chugging conclusion, leaving you craving this presence to weave soul crushing slams whenever the group channels their doomier side. “Gloom Shoals” does trick you into thinking this might actually happen thanks to the creeping ritualistic start, but what lies in wait is actually a well composed mixture of both doom and death, gradually building to somewhat explosive bouts of brutality before slamming back into the deep pulsating depths the distortions and bass guitar are able to string together. Yes, it becomes obvious that The Fog‘s strengths lie largely in the death metal they perform, and “Entropy Pillars” stands as the best example of this. While the doom laden segments are far from bad or anywhere near as bland or seemingly random as they appear in “Inaneness”, these chunks still just don’t quite have the same bite as the more aggressive nods to acts like Cancer, early Sepultura, or the aforementioned Autopsy, other than the slam approaching four minutes in. Most of those slower areas are fairly generic at best, coupled with a rawer audio quality that is geared more towards speed and hostility than creeping intimidation. The random spurts of adrenaline laced with eighties thrashier punk vigor whip the listener into a frenzy for short bouts of time before immediately crashing down to earth to crawl along the dusty floors of a wood panelled structure, and not the murky depths of a random catacomb like the atmosphere wants you to believe exists, which is just unfortunate. 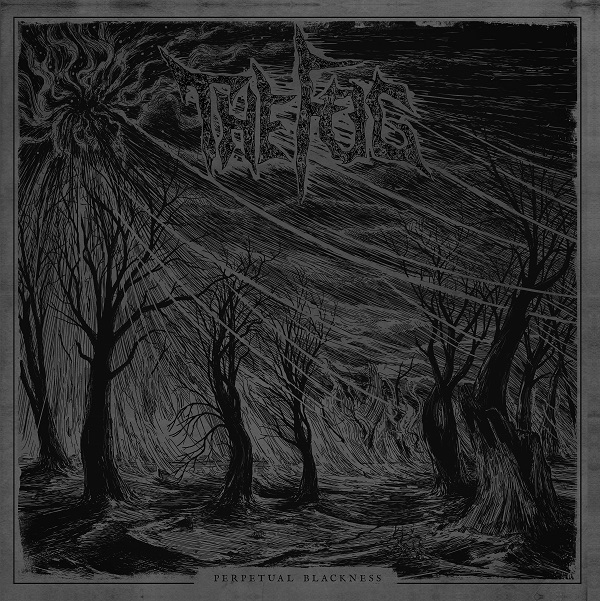 Perpetual Blackness isn’t exactly one of the strongest contenders in the death and doom metal worlds, but it’s one that shows a band with a good amount of potential and a grasp on how to write some good old-fashioned vile death metal. If anything, this recording is simply a sign of the group needing time to mature, not to mention a little more when it comes to crafting the two worlds they dabble with into a much more fluid presentation. But, if you really sit down and listen to this release from start to finish, paying close attention to the influences and varied genres on display, not only can you pick up a decent amount of maturity occurring right before your very ears, but you also get a remarkably broader sounding effort than what you initially would have thought. The problem here is refining all of that into one concise recording, something The Fog should have down by their next effort if the epic conclusion to “Grievous Scourge” is any indication of. Digital review copy of this release provided by Iron Bonehead Productiond.